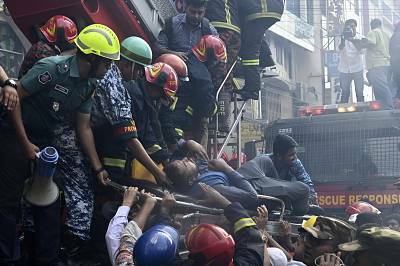 DHAKA, Bangladesh — A fire in a high-rise office building in Bangladesh's capital on Thursday killed 17 people and injured about 70 others, officials said.Many people were trapped inside the building, but fire officials said after battling the blaze for several hours that most had been rescued. "The situation is under control," said Debashish Bardhan, a Fire Service and Civil Defense deputy director.The fire had lost some of its intensity but was not yet fully extinguished, Bardhan said.Firefighters were shattering the building's glass walls to free toxic gas. The fire at the FR Tower, on a busy avenue in Dhaka's Banani commercial district, was the latest in a city where flouted building regulations and safety norms have made deadly blazes common.Shahadat Hossain, a central control room duty officer for the Fire Service and Civil Defense, said 17 people had died and about 70 others had been hospitalized.A Facebook Live video taken by Roy Pinaki showed five people climbing down from windows while burnt building materials fell around them. One person slipped from what appeared to be a rope that people were using to escape, bounced off utility wires and fell to the ground.Military helicopters joined the rescue operation, and one person dangled from a helicopter hovering over the roof as thick plumes of smoke rose.More than a dozen people who fled to the roof were rescued by firefighters using hydraulic cranes, Bardhan said.Witness Sajib Hasan said some people shouted for help from windows on the upper floors of the building. Heavy smoke deterred efforts by responders to get close to them, but Hasan said he watched at least a dozen people get rescued. Banani, the area where the fire broke out, is a busy commercial district with multistory buildings housing offices, universities and restaurants.Tushar-or-Rashid, an employee of the Vivid Holidays tour company on the building's first floor, said the fire began above them. "All of our staff have come out safely but we don't know what happened to the people who work in the upper floors," he said. 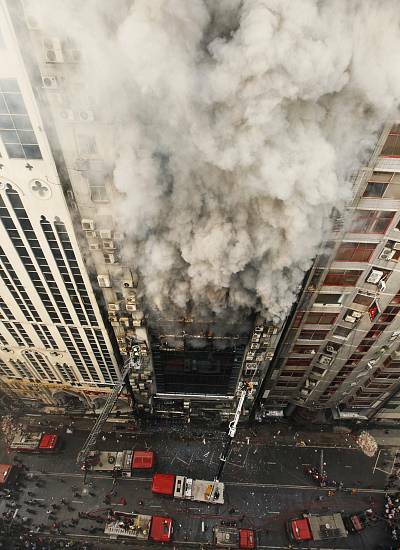 Rashid said the building has 21 floors.Fires are common in Bangladesh. 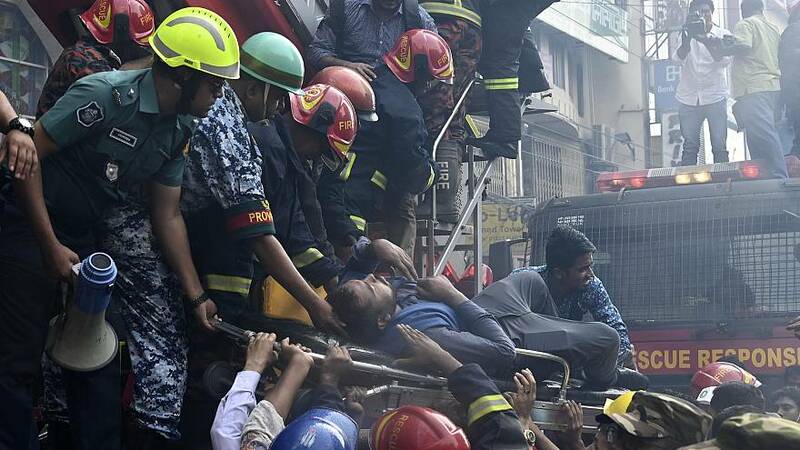 Last month, a fire in the oldest part of Dhaka, a 400-year-old area cramped with apartments, shops and warehouses, left at least 67 people dead.In 2012, a fire raced through a garment factory on the outskirts of Dhaka, killing at least 112 people trapped behind its locked gates. Less than six months later, another building containing garment factories collapsed, killing more than 1,100 people.Another fire in a house illegally storing chemicals in Old Dhaka killed at least 123 people in 2010.